The Fietsberaad reports that Dutch government expenditure on cycling has now reached an annual level of 487 million euros per year. Given the Dutch population of around 16 million people, that's approximately 30 euros per person per year, over the entire country, all cities, towns and villages, and out in the countryside. Much money is now being spent on improving regional routes, for longer distance commuters (I've covered this before), which leads to higher rates of cycling to work. Improvements of cycle parking around business areas should be done by business themselves. To catch up with The Netherlands other countries must spend more for a short time in order to progress quickly and then drop to the same rate as The Netherlands or spend the same amount and wait a long time (quality will then approach what The Netherlands has asymptotically, fast progress initially followed by a long period of catchup up). No country can "catch up" by spending less. Britain, with it's population of around 65 million people, needs to spend the equivalent of about €2 billion per year to match Dutch expenditure. The USA needs to spend approximately €10 billion per year. These figures may seem large, but it has been shown within The Netherlands that cycling actually saves Dutch companies considerably more than is spent on infrastructure each year. This is quite apart from health effects and the benefit to the economy of importing less oil and lower wear and tear on the road network. Also it has been shown that when all things are considered, building cycling infrastructure works out cheaper than not building it, even when we consider just long distance relatively rarely used cycle-paths. Apparently a British politician today claimed that the Dutch government spends just €3 per person per year on cycling. This is clearly a misuse of figures. €306 M spent by through local government. €207 M spent by through local government. In fact, of course, this is just one of many different ways that the figures could be re-arranged depending on what point one wanted to make. A lot of the funds spent by local, city of provincial governments was itself originally collected and distributed by central government. How this is sliced and diced is immaterial. It is rarely, if ever, possible to find exact equivalence between different countries for how they arrange their budgets because there are so many different ways to do it. The small amount of direct expenditure from city regions is due to the fact that these regions don't manage the roads and cycle-paths themselves. This is another reason why direct national government expenditure is low. National government also doesn't manage roads and cycle-paths directly. The estimate of €406M is on the low side. This is because all levels of government include cycling components in other projects. Cycling costs are therefore often invisible. It should also be noted that cycling infrastructure which is part of new developments is paid for by the builders of those developments. Note the acknowledged to be "invisible" cycling costs. All developments and plans include cycling and it's not usually considered to be something additional to the basic plan. Only where something exceptional is needed do the funds come from the cycling budget. That is why building an excellent traffic light junction for cycling in the Netherlands cost less than a tenth the sum charged to cycling of building a very bad one in the UK. Cycling funding in the Netherlands is not only at a far higher level than in the UK but it is also spent far more efficiently than in the UK. Also note the required investment by developers. We see benefits from this locally. The excellent infrastructure inside, to give access to, and to provide for recreational and commuting routes reaching several kilometres outwards from the newest suburb of Assen, for example, cost nothing from the cycling budget. These are also reflections of government policy. In order to get planning permission, developers in the Netherlands must present designs which work well for bicycles. The difference in expenditure between the UK and the Netherlands is vast. It cannot be reduced to a single figure because there is no equivalent figure to be found. It simply won't do for a British politician at no less a level than Parliamentary Under Secretary of State to make out that Britain's astonishingly low rate of expenditure on cycling is anything close to what is spent in the Netherlands. An attempt has been made to equate two entirely different things and to find an equivalence which does not actually exist. IMO, Norman Baker has used figures in a way which is dishonest. It doesn't matter what channels the money might be diverted through in either country. What matters is that it is spent and spent well. In the Netherlands the expenditure is at a very much higher level than in the UK and this money is also spent far more efficiently than in the UK. These are the facts. The results speak for themselves. What is Norman Baker actually comparing with, and a challenge. Norman Baker's comparison of total UK funds for cycling with the funds directly allocated by Dutch central government are interesting because they are so obviously a comparison of apples with oranges. The published Dutch figures which Norman Baker referred to are funds are for very specific uses. In 2013 these particular funds were overwhelmingly used for just one purpose - expansion of railway station cycle parking facilities. This one item is allocated €38M out of a total of €44 M.
Norman Baker is comparing a fund which is almost entirely for expansion of cycle parking at Dutch railway stations with the total government expenditure on cycling in the UK. Let's make this into a more honest comparison. Perhaps Norman Baker would be so kind as to let us know how much the British government is spending on railway station cycle parking in 2013. It's Sunday, so why not a church story ? Yes, this video shows people riding a variety of bikes in a church. Wilfred posted a couple of days ago about a recent bicycle party organised by a local bakfiets specialist. An event in the church next to the shop. In the distance at the end you can see Wilfred's Mango, Velox Incendia, which still impresses me every time I see it. BTW, Wilfred, it's ready for collection after yesterday's service. Also there are a variety of other interesting machines including a variety of bakfietsen, an old Flevotrike, and a Drymer prototype. Previously I posted about people cycling to church. Last weekend was the Fietselfstedentocht. 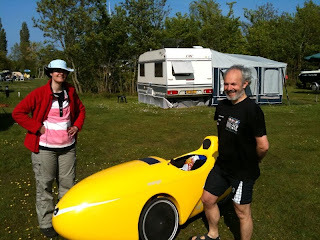 This is a touring ride for 15000 people each riding 240 km in a day. The first photo shows Marjon and I at the campsite near Sneek. I rode the Mango there from Assen with a tent, camping mat, sleeping bag, clothes and food for the three days stored inside. Everything went back in on Tuesday morning to ride back home, the trip each way adding another 160 km to the total. Marjon and Harry were riding their back to back tandem. It's a great machine for sociable riding. The ride is not a race, and in fact there is a maximum enforced average speed of 25 km/h. If you start at your allotted time and ride faster than that then you will be stopped at various timed points along the way. However, it was clear that plenty of people actually do treat it as a race. If you have an early start card, but leave late, you don't have to wait to be stamped at the timed points. As it happened, due to our getting to the start late my card appeared to be for someone who'd started an extra hour and a half earlier, which was just as well as I completed the ride in less than the expected time. While many riders were of the sporty disposition, on expensive road bikes, others were dressed up for the occasion, and all types of bikes were ridden. There seemed not to be many recumbents involved in this event. I was especially impressed by those who set off on delivery bikes, single speed tandems and such like, but can't help but think that those with nearly flat tyres would have been better off pumping them up before starting ! It's a long distance without having to do more work than necessary. Along the way we were offered apples, which I very gratefully accepted, and also soup and a milky drink, neither of which were vegan, so I skipped those. In any case I carried enough food and drink with me for the entire ride. And this is what I had by the end. All fifteen required stamps and a medal ! I started my bike computer a few minutes before the start and stopped it just after the end, 8 hours and 20 minutes later. The organizers did a wonderful job with this ride, and the many volunteers stamping cards and directing traffic with the police also helped the whole thing to run (as far as I can tell) completely smoothly. Also I have to thank Marjon's parents for their hospitality at the campsite. And how did the Mango get on ? Well, it got me there, got me back again and in-between it was a very comfortable and fast way of riding the tour. I've been practicing trying to ride a bit slower for a few days in order that I'd not wear myself out. The 80 km ride to the camp-site had a headwind all the way, and I averaged only about 28 km/h over that distance, conserving energy for the next day. At first I kept the speed down on the event itself as well. I didn't want to push past where there was not really room. However, after about a third of the distance it was clear that I wasn't working too hard, and the crowd became somewhat less with only "serious" riders remaining. As a result, I built up speed where it was safe to do so and stopped taking video. Quite a few km were covered at over 40 km/h, I had several people draft me for quite a long way, and one very fit young racer rode next to me at 43-44 for a number of kilometres. The Mango makes this balding grey haired old man as quick as a youngster. The last quarter of the ride includes very stiff headwinds on a very exposed dijk next to the coast of Friesland, and at this point the Mango was embarrassingly quick, still cruising at over 30 km/h when many were feeling the wind. However, my speed was moderated by a few short but surprisingly steep climbs. The very last five km or so are where youngsters who still have energy discover their sprinting muscles and really fly. At that point I was caught and passed by some that I'd recently passed. After the end I rode the 16 km back to the campsite, ate a bit of dinner, and slept quite soundly until the morning. The Fietselfstedentocht is really a great day out, however you want to ride it. There are more details of the Fietselfstedentocht in my previous post, in which I mentioned that Harry wasn't going to be able to use his ticket. As you can see, he and Marjon did in fact take part, so I bought him a new ticket. Oh, and yes, I've fitted a small solar panel on top of my Mango. I designed a small charge regulator to go with it - it keeps the battery for the lights topped up. Ideal for touring. I used to commute along roads very near here myself when I lived in Cambridge, and just like Paul in this video, I'd occasionally have more than a close call and actually be hit by a car. The comparison with cycling in the Netherlands is remarkable. While I cycle much more now than I ever did in the UK, not once have I had the least bit of hassle here due to a driver. While Britain continues to ignore the need for decent cycling infrastructure, the situation will remain the same. The cycling rate will continue to flatline and cyclists will continue to be treated as outlaws with no legitimate place either on the road or on the pavement. Copying Dutch infrastructure which gives cyclists direct journeys in safety is the only way of turning this around. Real action is needed. Not yet more empty promises. I know of many Dutch people who make cycling videos, but not one of them records their cycle rides to catch "evidence". Rather, Dutch cyclists' videos are made to record pleasant experiences of cycling. There are many of them on youtube. Isn't it better that cycling should be something enjoyable and full of good memories ? Something not only for commuting adults but that you're also happy for your children to do ? Compare the problems faced by British children with the freedom experienced by Dutch children. There's also a blog post showing what happens when a similar incident occurs in the Netherlands. I came across the Cambridge video on the I Pay Road Tax blog, thanks to a tip from Biking Brits. The German cycling organisation, the ADFC, recently published alarming criticisms of cycle paths in general which have in turn been widely criticized by Dutch commentators. Remembering my own experiences on German cycle paths, I decided to make a video comparing the situations on the two country's paths, which you can see above. and a long wait. It's not like that in the Netherlands. I understand why German cyclists are dis-satisfied with their cycle paths. The quality obviously varies from one place to another, but in many cases they're simply not built with anything like the quality that is required to ensure the safety and convenience of cyclists. However, they have made a mistake in criticizing all cycle-paths. Dutch cycle paths are different. They've done a proper job. This is why Dutch cycle paths really are both convenient and safe. They are designed to be used by everyone, regardless of ability of experience. Fast cyclists use the same infrastructure as children, and elderly people. The video above doesn't claim to be comprehensive. Rather, it's the result of my looking at a small amount of video that I shot in Germany, mainly near Leer as well as near the border around Rütenbrock, and finding how the Dutch had treated similar situations here in the Netherlands. Having visited other parts of Germany, and read comments by Germans about their cycle paths, I think it's fair to say that the conditions presented in the video are not far off normal. Germany actually presents quite an interesting case. The cycling rate varies by a remarkable degree between different areas, and does so with the quality of cycling provision. While German cycle paths may not always be of an adequate standard, where there are extensive networks people cycle in quite high numbers. British cyclists, comparing only with what they get in the UK, are frequently impressed by German cycle paths. I had several people say just this to me at a recent cycle show in Germersheim. The difference in quality between Britain and Germany goes a long way to explain why under 2% of journeys in Britain are by bike vs. 10% in Germany. The Beauty and the Bike project compared the situation for German and British teenagers, showing quite clearly that cyclists in Germany in many places have an advantage over cyclists in the UK. However, the difference between Germany and the Netherlands also explains why the Dutch cycling rate is nearly three times that of Germany. Any place which wants to truly achieve a high cycling rate really needs to copy from the Netherlands, where 27% of all trips are by bike. This country has achieved such a high rate of cycling because the experience of everyday cycling is not remotely like taking part in an extreme sport. Essen: "Cycle friendly city" ? The still photos in this post show cycling conditions in Essen in Germany, a city which is struggling a little with cycling and currently has a modal share of around 5% of all journeys by bike. Despite this, the city makes the claim of being a "cycle friendly city." The first photo shows someone waiting to cross several lanes of motorised traffic (the green overpass can also be taken), the second shows a narrow shared use path to which the alternative route is a four lane each side road. Apart from the lacklustre infrastructure, and cyclists facing a huge number of cars on the roads, there is also a problem of speed limits being ignored. A taxi driver told us that the 50 km/h speed limit referred to "50 km/h for the front wheels and 50 km/h for the back wheels." A large part of the problem with Essen is caused by post second world war reconstruction, with the then considered to be "modern" wide roads. 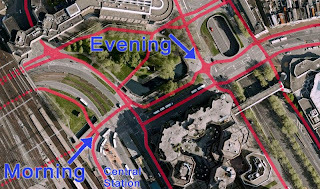 However, these problems due to old-fashioned car dominated planning can be overcome, as Nijmegen demonstrates. On the positive side of things, in much of Germany you do find a reasonably tight grid of cycle infrastructure of some type or another. 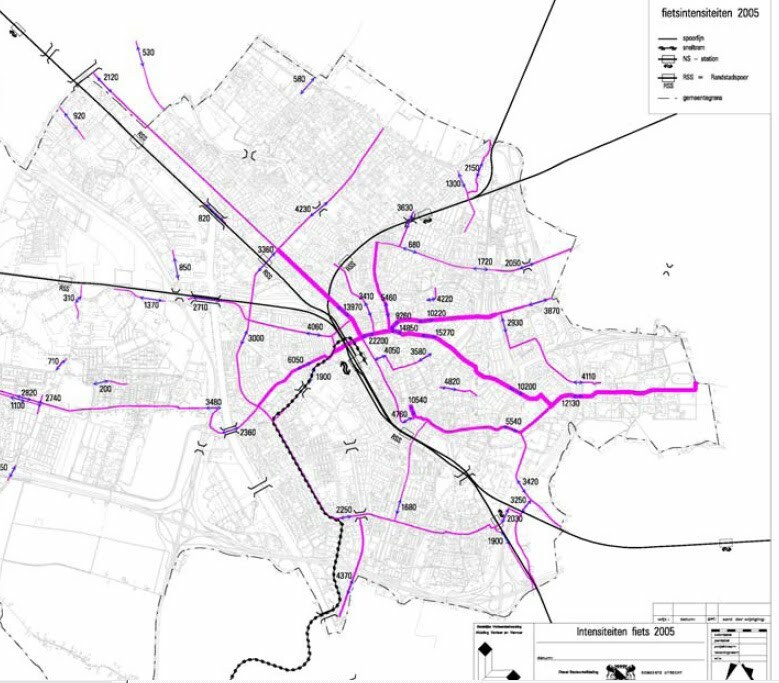 A tight grid of high quality subjectively safe routes is what enables cycling, just as has been found in the Netherlands. This is why cycling is possible by a fairly wide range of people in Germany and why roughly 1 in 10 journeys in that country are made by bike. However, the quality of this network falls well below that of the quality of cycle infrastructure in the Netherlands. This makes it is un-usable or inconvenient for those want to cycle fast (hence ADFC complaints) and not particularly easy to navigate, quick to use or so safe as it should be. In my view, the difference between the modal shares of Germany and the Netherlands can largely be put down to the difference in quality of the different country's cycle infrastructure as demonstrated in the video above. Germans want to cycle more, but their infrastructure makes it less attractive than it should be. to the road, and there are cars parked on it ! Campaigning for better infrastructure is a negotiation. If you ask for Dutch infrastructure, you are unlikely to get Dutch quality of infrastructure in the first instance. You may, if you're lucky, get the equivalent of German infrastructure instead. However, ask only for German infrastructure and you're very unlikely to get that either. If your aim is to see everyone cycling then always ask for the very best. i.e. infrastructure which works for all cyclists including the young and the old and the sporty, not a compromise which doesn't work for everyone. Campaigners must not have low aspirations. Earlier this year a German TV programme showed how Germans are amazed at how bad cycling is in London. More recently, another German TV programme covered many of the same issues as I pointed out in my video about the problems with German cycling provision. There's a lesson here. While countries like the UK may think that countries like Germany have achieved something worth emulating, this is not the right place to look to in order to progress. You need to set the highest possible standard, not set about copying something which the people who live with it don't actually find to be good enough. The best examples of cycling infrastructure to emulate are to be found in The Netherlands, but even here you must be careful to select only the best examples. Don't assume that Dutch contractors will inherently do the right thing, because they won't. A recent organised bike ride from Haren in the Netherlands to Haren in Germany and back again gave an opportunity to try out some more German cycle-paths and the results were similar to what I'd experienced before. Assen, the Dutch city which we live in, only started to claim to be a "cycling city" once and after the cycling rate climbed above 40% of all journeys. The website where the claim was made then was rearranged, and there is now no such claim made for our city. Just how safe are Dutch cyclists and Dutch cycle paths ? case used by school children. I've pointed out before that the Netherlands has the safest roads in the world, and that cycle paths have also lead to this country having the safest cyclists in the world. However, for some this evidence simply isn't enough. In the English speaking world in particular, "experts" continue to insist on the ludicrous idea that cyclists are safer in the proximity of cars than without them. However, these countries also continue to have a stunningly low cycling rate. Now the Germans have joined in too ! According to ADFC, the German Cyclists’ Union, people should cycle where they are safest: on the road among cars. Not on separate bike paths, as this would be more dangerous according to various studies. In the United States this news is eagerly distributed by opponents of bike paths. Dutch experts obviously refute this report. The main argument in the German report is that cycling in the Netherlands is dangerous as 40% of all traffic accidents involve cyclists, whereas these only account for 27% of all travel. And this in spite of the number of bike paths. In Germany, on the other hand, there are fewer bike paths, as well as lower numbers of bicycle accidents in relation to the percentage of travel by bicycle. Conclusion: bike paths are dangerous. This conclusion about the (supposed) danger of separate bike paths in the Netherlands is however by no means well-founded or warranted. As a matter of fact in the Netherlands cyclists are victims of traffic accidents in not 40% but even 50% of all cases, data provided by Fietsberaad demonstrate. But the percentages and statistics of CBS/Ministry of Transport, Public Works and Water Managements do not at first glance reveal that the overwhelming majority of these casualties are caused by unilateral accidents. A study by SWOV concluded that 80% of all bicycle accidents consists of unilateral accidents and accidents among cyclists. Moreover, this percentage is increasing. A mere 20% of all accidents involving cyclists concerns motorised vehicles, and numbers are falling steadily. The ADFC article emphasises accidents with motorised vehicles, whereas the main problem in the Netherlands consists of these unilateral accidents, instead of collisions with other vehicles, for example cyclists colliding with bollards. Anyway, unilateral accidents cause in general only minor injuries. A study by Consument en Veiligheid into unilateral bicycle accidents (November 2008), commissioned by Rijkswaterstaat Dienst Verkeer en Scheepvaart (RWS DVS), revealed that the annual number of treatments at Emergency Departments (SEH) after unilateral bicycle accidents is approximately 46,000. Approximately 6,000 of these victims require hospitalisation. The estimated annual number of traffic fatalities caused by unilateral bicycle accidents is 50. In 2007 there were 189 traffic fatalities among cyclists in the Netherlands. And finally, improved safety by separation of traffic has by now been conclusively proven in the Netherlands. See for instance the fact sheet ‘Kwetsbare verkeersdeelnemers’ by SWOV (July 2009). This argues in favour of a complete separation of traffic participants with large differences in mass and speed. After all, in serious bilateral conflicts between for instance a car and a cyclist the inequality ratio is huge: 126. This means that in these types of conflicts the number of cyclists injured is 126 times higher than the number of motorists, seeing as people are well-protected in their cars and run relatively little risk at low speeds. In accidents involving cyclists and pedestrians the inequality ratio is a mere 1.7. In accidents involving two cyclists the ratio is of course 1. For the safety of cyclists it is therefore better to separate them from motor vehicles by providing separate bike paths. It's also worth pointing out that the view of safety is a bit different here. There are three types of safety to consider if you want to achieve a rate of cycling which is comparable with the Netherlands, or the safety that cyclists enjoy here. You may also be interested in the concept of Sustainable safety which has lead to a continuing increase in safety in the Netherlands. I have made a video comparing Dutch and German cycle paths. In addition to the points made by the Fietsberaad statement above, another fact worth pointing out with regard to Dutch cycling crash statistics is that there is a far wider cycling demographic in the Netherlands, including many people who are more prone to injury when cycling and who simply don't cycle in other countries with anything like the same frequency. Retired people cycle for around a quarter of their journeys in the Netherlands and they are the unfortunate victims of 2/3rds of all the injuries and fatalities. Note that the collisions in which these crashes take places almost always involve only the retired person. No other cycles or other vehicles are involved in most cases. Without this more vulnerable group cycling, Dutch injury and death statistics when cycling per km travelled are already the best in the world and they would look about three times better than they do now if it were not for this additional burden of also having the most vulnerable cyclists in the world. The photos show four of the many different cycle paths within a few hundred metres of our home in Assen, with different types of cyclists using them to cycle with a remarkable degree of safety compared with elsewhere. It's impossible to over-state the importance of a high density grid of extremely high quality infrastructure. On Sunday we went on the Sinnertocht. A 60 km trip around the Groningse countryside organised by Jan and Harma de Vries of Sinner Ligfietsen. At last it really looked like spring had arrived, and we had glorious weather, though also fairly stiff headwinds. This is frequently a problem in this area. There are no hills to slow down the wind. I rode my old Pashley PDQ and Judy rode a Sinner Spirit. She's tried a few others, but thinks this could well really be the right touring bike for her. It's a short wheelbase bike with full suspension, and a comfortable seat neither too close to nor too far from the ground. My friend and collaborator Mark Wagenbuur has made another excellent video, this time showing the rush hour in Utrecht in Spring. Utrecht's cycling rate is 33% of all journeys by bike. Far from the highest in the Netherlands, but of course they have plans to increase this. However, quite a lot of people live in Utrecht and the result is that the place already has impressive numbers of cyclists. Note that the film was made a little late to catch all of the rush hour, and in particular school children were already at school so you won't see the usual masses of children amongst the cyclists. The second film was made in the evening rush hour nearby (again this is too late to get lots of children going to and from school). You can see both locations on the map. 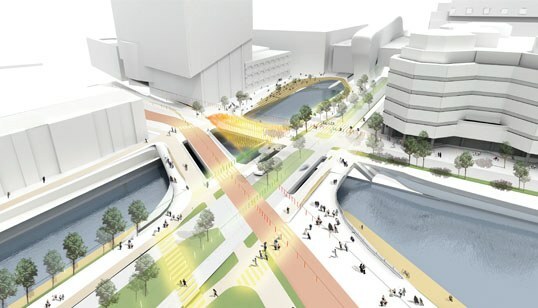 The entire area is to be redeveloped and information has been provided on the City of Utrecht website. 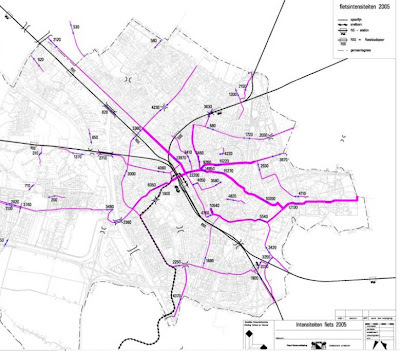 Of particular interest is the section where they say "Vredenburg is one of the busiest junctions in the city centre. Every day, more than 22,000 cyclists and 2,500 buses pass this place. The challenge in designing this new junction lay especially in creating clarity and safety for all users. In the new design, cars, buses, cyclists and pedestrians are clearly separated from each other." Note the priority is to separate different modes. If cycling is to be attractive this is essential. The deeper lying motorway that can be seen in my aerial picture on the right was planned in the 1960s and built in the 1970s in the old city moat. But it will be demolished (it was already closed just weeks ago) and the water will return. All the various cycle paths will be a lot less in number and straighter to make things clearer and the area might look like in the other picture I also attached. I hope it will create a better station area than what was created in the 1970s. Last but not least I just found a webcam that you can control. Utrecht perhaps has the largest amount of cycle parking at a railway station of anywhere in the world. There are currently over 14000 cycle parking spaces at the station, soon to be expanded to over 20000. However, when I was there for a meeting a couple of weeks ago I couldn't find anywhere to park my bike, which ended up locked to a post with a "don't park your bike here" sign (all the posts without the sign were taken). Previously Mark made a video of the same place in winter when it had snowed. Compare the number of cyclists. My colleague Harry unfortunately can't take part in the Fietselfstedentocht this year, so he offered me his entry form, which I've very gratefully accepted. The 240 km long ride is limited to 15000 entrants. The population of the country is around 16 million, so nearly one in a thousand people from the Netherlands take part in this event each year. The event has been held every year since 1912, except in 2001 when an outbreak of Foot and Mouth disease caused cancellation. I'll be riding my Mango over the course. It's now a touring event, not a race, and the 25 km/h maximum allowed average speed means no real advantage from aerodynamics, but it's comfortable to ride in the Mango. We'll be setting off in 23 groups of 600 people at a time, each group starting eight minutes apart between 5:00 and 8:00 on the morning of the 24th of May. I'm in group 8, which means starting at 5:56. My plan is to ride to Bolsward the day before with my tent and perhaps return the day after the event. It's about 85 km from here. The official website of the Fietselfstedentocht is here. The original Elfstedentocht, dating back to 1909, is an ice skating event over 200 km which is named for the Eleven Cities ("Elf Steden") that the frozen canals pass through. This event is only held on winters which get cold enough (last winter the canals and lakes froze enough for skating, but not enough for the elfstedentocht). The 1963 Elfstedentocht, the coldest and most difficult in history, was recently the subject of a very enjoyable film. There are also Elfstedentochts by roller skate and scooter (pushing with one foot, not with an engine) so by taking part in the cycling version I feel I'm definitely taking the easy option. The Dutch version of the wikipedia page has more information. I just came across an old copy of the newsletter of my local cycling campaign group from when we lived in the UK. This is the cover of Issue 7 of the Cambridge Cycling Campaign newsletter from July 1996. We were all very confident back then as the National Cycling Strategy had just been published. The stated aim was "to double the number of cycle trips in Britain by 2002, and to double them again by 2012." Allocate priority in road space to cycling (British cyclists can judge for themselves whether this actually happened. The much written about london superhighways are not much of an example. Reduce cycle theft (Has this happened ?). Raise awareness of the advantages of cycling (training courses, "continuing professional development", and also including school cycle training. Sadly, the rate of children being driven to school has risen dramatically since then and more training did not result in more children cycling). Unlock resources to meet the objectives of the strategy (Could that be "jargon" ? I feel that if I knew what it meant I might be able to comment). The level of cycling in the UK was under 2% of journeys in 1996 (just the same as now) but if the strategy had been a success perhaps that would have increased to around 8% of trips by this date. It might have helped if there was a bit more concrete stuff being discussed instead of so many "soft measures", but sadly, of course, the proposals were ignored and the strategy was dropped before it achieved anything. A review was written, which starts with "The Government is committed to encouraging more cycling in England" and carries on to explain that actually they'd achieved no increase at all. The National Cycling Strategy from 1996 is archived online here. Lots of big words, which led to no real action. This is one of the big problems with cycling in Britain. It's a talking shop. There are many proposals, much time is consumed in discussing things. However, little actually gets done, and what does get done is all too often done extraordinarily badly. At the time of writing there is a new National Cycling Plan for England in the offing. It would be nice to think this was a guaranteed success, but there are already criticisms about it - such as that the aim is to increase the level of expenditure on cycling to a paltry 0.3% of the transport budget. That's really not taking the problem seriously. Is it really too much to hope for a more positive start and a more outcome this time around ? Update: with the benefit of hindsight it's now possible to report that the National Cycling Plan referred to in the paragraph above came and went very quickly without any obvious progress being made. It's never too late to start doing the right thing. You just need to actually make a decent start. Until that happens, cycling in Britain will continue to flatline.